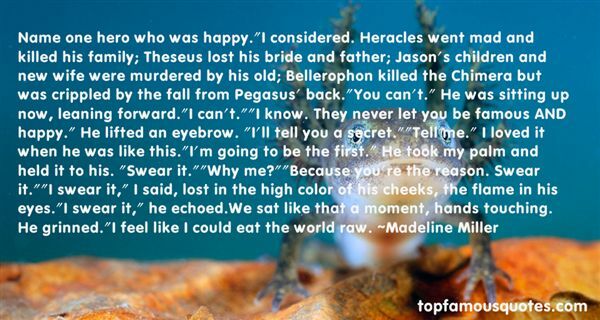 Reading and share top 3 famous quotes and sayings about Heracles by famous authors and people. Browse top 3 famous quotes and sayings about Heracles by most favorite authors. 1. "...Heracles was strangely silent. What is he thinking? / Geryon wondered. 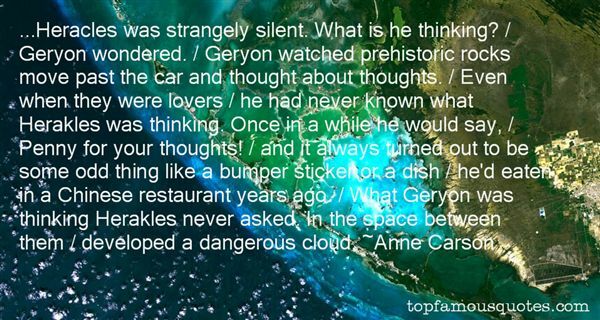 / Geryon watched prehistoric rocks move past the car and thought about thoughts. / Even when they were lovers / he had never known what Herakles was thinking. Once in a while he would say, / Penny for your thoughts! / and it always turned out to be some odd thing like a bumper sticker or a dish / he'd eaten in a Chinese restaurant years ago. / What Geryon was thinking Herakles never asked. In the space between them / developed a dangerous cloud." 2. 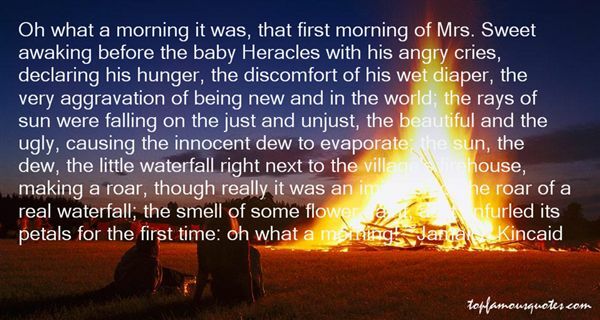 "Oh what a morning it was, that first morning of Mrs. Sweet awaking before the baby Heracles with his angry cries, declaring his hunger, the discomfort of his wet diaper, the very aggravation of being new and in the world; the rays of sun were falling on the just and unjust, the beautiful and the ugly, causing the innocent dew to evaporate; the sun, the dew, the little waterfall right next to the village's firehouse, making a roar, though really it was an imitation of the roar of a real waterfall; the smell of some flower, faint, as it unfurled its petals for the first time: oh what a morning!" 3. "Name one hero who was happy. "I considered. Heracles went mad and killed his family; Theseus lost his bride and father; Jason's children and new wife were murdered by his old; Bellerophon killed the Chimera but was crippled by the fall from Pegasus' back. "You can't." He was sitting up now, leaning forward. "I can't. ""I know. They never let you be famous AND happy." He lifted an eyebrow. "I'll tell you a secret. ""Tell me." I loved it when he was like this. "I'm going to be the first." He took my palm and held it to his. "Swear it. ""Why me? ""Because you're the reason. Swear it. ""I swear it," I said, lost in the high color of his cheeks, the flame in his eyes. "I swear it," he echoed.We sat like that a moment, hands touching. He grinned. "I feel like I could eat the world raw." I cannot love a man who cannot protect me."